Michael,a 45 y.o. plumber presented with severe pain on the right side, bloating and nausea, His G.P. had diagnosed fatty liver disease by ultrasound. 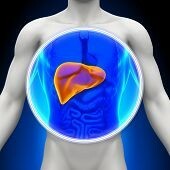 Fatty liver is a pathological increase in the fat content of liver cells that can severely compromise hepatic function. Aim to limit dairy foods including milk, processed cheese, cream and butter. Opt for organic low fat yogurt and cheese such as ricotta or cottage. Avoid margarines and similar type spreads. Consume only free range chicken and meat as artificial growth hormones, antibiotics and steroids increase the liver’s workload. Drink 2 liters of water each day. A non-alcohol herbal formula to support the liver function including: Milk thistle, a well-known herb and potent antioxidant that regenerates liver cells.It contains a flavonoid complex called silymarin, which studies have shown to protect the liver cells from toxins, it also promotes regeneration of damaged liver cells and has anti-inflammatory properties. Dandelion – is particularly effective in reducing inflammation. It also helps to improve bile flow, and it provides a rich source of vitamins and minerals that protect the liver. Lipotropics: These nutrients include choline, methionine and betaine, which mobilize the flow of fats away from the liver, out through the large intestine, and thereby decrease fatty deposits.